Sure the U.S. market seems to have retail outlets on every corner and a shopping mall at every major highway intersection. And if the population of physical stores were not enough, consumers are continuing to direct more retail spending through online retailers. So what exactly would be the incentive for a retailer to open new locations, especially a foreign retailer that is new to the American market? Some of those answers can be found in this Stores Magazine story. 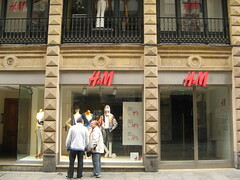 It discusses the influx of foreign retailers into the U.S. market. What lures these retailers? Money, of course. Spending by U.S. consumers is enormous. But placing stores in the U.S. may also improve the retailer’ image in its own country as a U.S. presence may give the impression that it is a prestigious global retailer. While this story offers several nice examples of foreign retailers who are entering the U.S., it also discusses how foreign retailers may find the going to be difficult. The potential pitfalls are pointed out with a discussion of British retailer, Tesco, who did not achieve success and eventually pulled out of the American market after losing billions of dollars.